It's been over five months since I posted here and there is many a reason for this. Most sincere is that I need time for my family. Needs must as the devil drives - and here in Greece the devil drives a very hard bargain these days, so I'm working long hours in my day jobs - thus what little free time I have goes to my babes (12, 13 & 40+), not writing. Braced for worse to come. Then it seems like everything is breaking: the cooker, the washing machine, my sewing machine, the toaster, my computer - bits are even falling off the house. Prices are rising. Taxes are impossible and wages are dropping as are hours of work. Even my phone company seems to be playing sneaky tricks. And dribble of drabbles is all I've come up with. And did I write with all this free time? 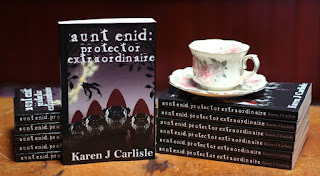 You may or may not know this but today is Aunts and Uncles Day and so it seems most fitting to catch up with Karen J. Carlisle, fellow of The Scribblers' Den and the author behind Aunt Enid: Protector Extraordinaire. I've managed to get her to take a break from her hectic schedule and answer a few questions about Aunt Enid and other projects she is working on. Why don't you get yourself a nice cup of tea and join us? So Karen, most of your novels are in the Steampunk genre, what made you take a break from writing Steampunk this time? It certainly sounds like a real 'brainstorm'! Now, you write mostly detective fiction, what are your influences and what qualities do you need to create a good detective novel? I grew up on a steady diet of Agatha Christie, Ngaio Marsh and Sherlock Holmes. I‘d read almost all of them before I started high school (when I re-discovered fantasy and science fiction). To create a detective novel, you need to know the solution first, so you can lay clues, red-herrings and distractions that make sense. It requires attention to detail, in both the mystery and characters, and just enough suspense to keep the reader interested. Aunt Enid has the perfect qualities of a favourite aunt; nice cooking, home with doors always open and everything in the strictest confidence. Is she based on a favourite aunt of yours? She is based on my own great Aunt Enid and my grandmother, both of whom I have very fond memories. As a child, we used to visit Aunt Enid’s house. She’d make lemon butter (curd) on her wood-burning stove, and had two enormous hydrangeas - one on either side at the bottom of her front stairs. My grandmother used to make toffees, ginger slice and fruit cake - and ride motorcycles during the war years. Both ladies sound like poeple to inspire many adventures. But getting onto gnomes; gnomes are an integral part of the story. 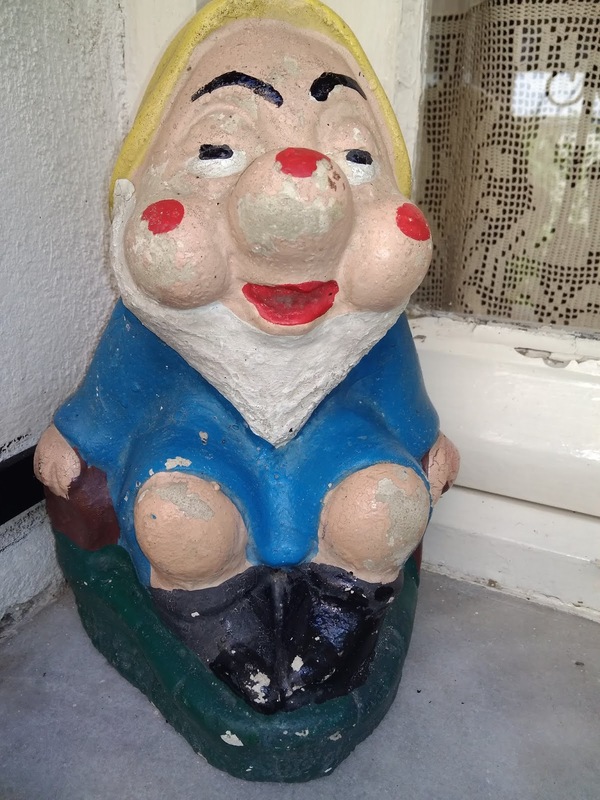 I'll be totally honest, I never really liked them, but the one I inherited with my house has taken on a new standing since reading Aunt Enid - I have even named him Manos (o vavos) Are you a fan of garden ornaments generally? I think there are two types of people: those who love garden gnomes (or secretly do) and those who have a morbid fear of them. I’ve had various gnomes in the garden over the years. Back in the nineties, you could get ones with axes buried in their skulls… I always wanted one of those. It got me thinking… why did they have axes in their skulls? And why do some people have armies of them in the garden? Their story needed to be told. 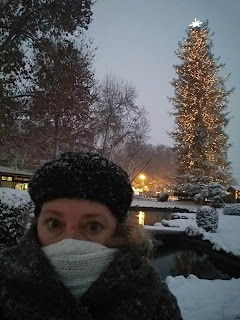 I have mentioned to you before how I love the use of weather in the story and how I get the 'feel’ for Australia, was that a conscious intention? Yes. In my author bio (see below) I state I am ‘not keen on South Australian summers.’ They are dry and hot. I’m an ex-Queenslander and I don’t cope at all in zero percent humidity, even after almost thirty years in Adelaide. I started writing ‘Aunt Enid’ as we were experiencing early heat waves last summer. It was hell! So, I decided to use the weather as a plot point - one of the keys facilitating The Dark’s entry into our world. Yes, I remember you to the members of The Scribblers' Den about the Adelaide heat. Another element in the story is bees. If you had Aunt Enid's ability to talk to bees, what would you say to them? I love bees. They are so important to pollination of much of our food crops. I have a chemical-free garden (I don’t spray insecticides etc) and I plant things in the garden for them - and they don’t sting me, as I’m allergic. We have an agreement. I’m often asking them not to sting me. They seem to listen. Aunt Enid has lots of charms and warning signs, like the hydrangeas, around her house. Are you superstitious in any way? I wouldn’t say superstitious. I walk under ladders, like black cats and when asked, consider ‘13’ as actually my lucky number. I do think it’s interesting looking at how some superstitions originated. Oh me too! I always find Saturday the 14th is when things go awry! I'm sure it's because I let my guard down. Lemon butter, or lemon curd as it is called in the UK, features throughout the story. Do you have a favourite recipe you'd like to share with us? Did you know that July 26th is Aunt's and Uncle’s Day in the USA? Now that you do, will you do anything to celebrate? I just found that out. I hadn’t previously known. I should do a blog post and an ebook sale to coincide with your book review blog post? Okay. Yep, I can do that. Use the code: US23D at the checkout. Oh wow! That's so generous of you Karen. I'll be totally honest with you, I thoroughly enjoyed Aunt Enid: Protector Extraordinaire. Will we be hearing more from her in the future? Yes. I have an idea for a story on how Agnes became a Protector. There are a couple of clues in ‘Aunt Enid’ as to when it will be set. I can't wait! You recently co-wrote a song and I believe even had one inspired by your stories would you like to tell is something about that? Ah, yes! That was a blast. Earlier this year he asked if I was interested in writing some lyrics. I was intrigued. How could I resist such an opportunity? I wrote ‘The Gadgeteer’ and Richard completed it with music. The Gadgeteers appear in Viola Stewart’s last adventure, The Illusioneer. We meet them in Venice as they ‘greet’ English tourists. The Gadgeteers are a not-so-secret Society determined to convince Queen Victoria to allow free trade of technology in Great Britain. The song questions their motives. 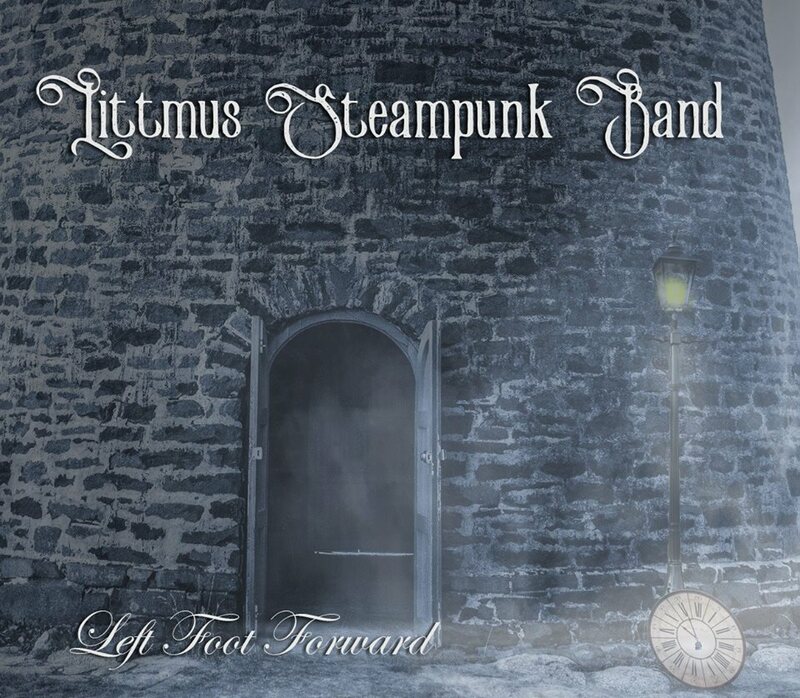 You can buy the album via Bandcamp - https://littmus.bandcamp.com/album/left-foot-forward - or contact Richard via his webpage if you would prefer a CD (posted within Australia). 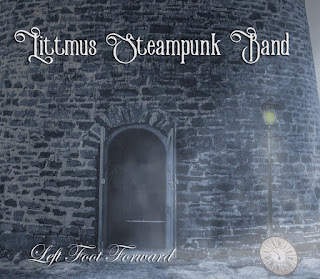 I’m looking forward to more collaborations with Richard and the Littmus Steampunk Band. They are an exciting band, that's for sure, and it must be an honour to participate in such a project. So, what can we expect to see from you I'm the future? More steampunk, more mysteries and some fantasy. First I must finish The Department of Curiosities’, then decide which to revisit first - Aunt Enid or continue onto the second DOC novel. I’ve also got a fantasy story/series bubbling away in the background, and at least two stand-alone novels, set in both my steampunk and fantasy worlds. You can follow updates either on my webpage ( https://karenjcarlisle.com/writing/works-in-progress/ ), sign up for my newsletter or get sneak peeks via my Patreon page. Well, it's been great sharing a cuppa with you. I hope you have a great winter there in Adelaide. As you know, it's summer where I am and I'll be retreating to the mountains to avoid the heat for a week or two and hopefully get some writing done. I'll be sure to catch up with you when I return, in the meantime, enjoy the read! Karen J Carlisle is an imagineer and writer of speculative fiction – steampunk, Victorian mystery and fantasy. Manos, the gnome from my home. I never really liked gnomes, but I'm looking at Manos in a whole different light these days, and I'm thinking of planting hydrangeas outside my door. Karen J. Carlisle and her latest book Aunt Enid: Protector Extaodinaire are to blame! Aunt Enid is a feisty octogenarian with an uncanny ability at winning bingo, a garden full of gnomes and a freezer stuffed with scones. Kind of like anyone's favourite aunt really, except that Aunt Enid has a secret; she is protecting all of Australia and perhaps even the world. It isn't until the people around her start getting hurt that her secret is discovered by her niece Sally. Agnes, her bingo buddy, seems more interested in matchmaking than helping the cause. Will she survive her toughest battle yet and save the ones she loves? Ask Red the garden gnome, he knows. Well I wasn't at all disappointed. Karen writes in a style that is suitable for all ages, her characters are engaging and lovable, there are enough clues to keep you wondering whodunnit and plenty of tension to make to turn the next page. I particularly love the references to Australia, even though I have never been, I feel I got a real taste of the country. I would like to see more of Aunt Enid. Grab a cuppa and snuggle up in a cool corner of the garden and get carried away on a fun adventure! 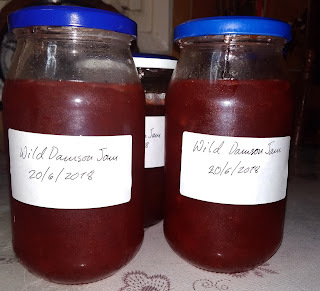 The Writer, the Word Demon and Wild Damson Jam. Once upon a time there was a writer who lived in house surrounded by titanic fruit trees. She was a little known writer who wrote mostly for her own pleasure and because, at times, it felt like there was a ravenous word demon roiling inside her. She loved creating worlds of wonder and impossibility, etching out visual and sensual nuances with language. Then one day, because she had a whole lot of other stuff to do, she had to abandon tug-of-war with the demon and wean herself off creative word usage. It was hard going and she missed it dearly, but there was no other quick and easy way to feed her family, and a ten-hour day job didn't leave much energy to play with words. How she longed for the summer, a time of freedom and fruitful work at her ageing laptop. In her notebooks she had been scribbling dreams and visions of other worlds, she had been visited by so many characters that she was beginning to feel her head would explode. The summer inevitably arrived and finally she sat down to write. She prodded the the demon affectionately. 'Come out to play!' she demanded. It didn't so much as flicker it's ears. She jabbed at it for a few more days but it did no more than lower it's scaly eyelid and look right through her. She kicked at her desk in frustration and fled into the garden. ...the fruit trees began to thrash above her. It rained cherries first of all. A storm was brewing in the mountains all around and the darkening sky was encroaching on the sun. The air zinged with static and the fruit trees began to thrash above her. 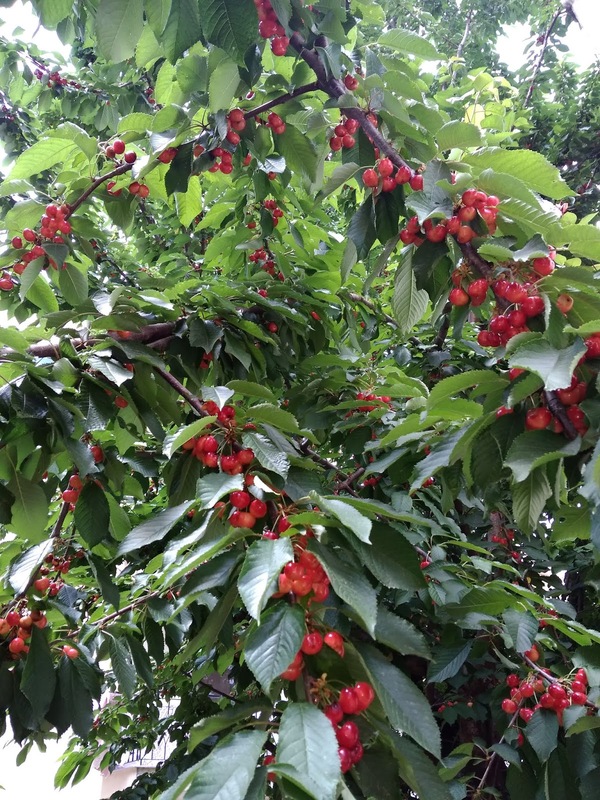 It rained cherries first of all. Grabbing a ladder and a bowl, the writer gathered the ripe fruit knowing that a jam making session would cure her blues and might even lure the word demon from hibernation. 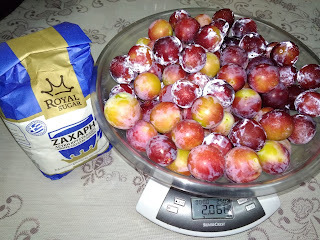 She left the bowls of glistening fruit on the kitchen table while she slipped out to buy sugar. On her return she found only the rotten worm-ridden fruit left. Her children lay snoring, their bellies bloated and their faces smothered with cherry blood. In frustration, the writer went back to her laptop and wrestled the demon again. It stretched a lazy talon in her direction but never stirred. Instead, she went and scrubbed the bathroom until it glistened. At least something positive would come from the day. The next day she bought sugar home with her, but most of the cherries were already scattered in the yard after the storm and the sparrows fought over the last hanging few. Leaning from the balcony like a love struck Juliet, the writer gathered a few kilos of the globular gems. Above the porch the wild damson was laden with fruit, tart and ruby red they glistened like semiprecious stones in the dark green branches. Leaning from the balcony like a love struck Juliet, the writer gathered a few kilos of the globular gems and rushed inside. She boiled the fruit and fished out the stones that would break the demon's teeth and the tough skins that would lead him to choke. She added the sugar and boiled the jam. She waited for it to thicken. It never did. She tested it thrice and another dozen times, but it never wrinkled. Swearing under her breath she poured it into jars and hoped it would at least taste okay. The demon opened an eye when the writer lay the jam at the entrance of his lair. She dipped a spoon into the syrupy mixture and held it out. Raising it's head slightly, it tasted the air with its blue forked tongue and then rolled it's nose under its wing. She brought bread and butter - the unsalted kind - because salt shrivels the guts of word demons, dries them right up. After slathering a few hunks of bread with creamy butter and the sweet juice of the wild damson jam the writer left the word demon in peace. The demon opened an eye when the writer lay the jam at the entrance of his lair. The town clock struck three am and the writer awoke. The word demon lay coiled at her feet flicking it's tail like an angry cat. 'Don't you dare wake my husband.' the writer whispered. The demon huffed a breath as rotten as bad poetry in her face, it's eyelids blinking inquisitively. The writer gathered her notebooks and sat at the laptop, a smile on her face. The word demon sidled past her, it's haunches so broad that it nearly toppled the knickknacks in the hall. The demon sat expectantly in front of the pantry. A whole loaf, a pat of butter and a jar of syrupy jam later the writer finally put words down. The demon slept contentedly at her feet, it's tail twitching as it dreamt of wild damson jam. 'It's great to have you back.' the writer thought. If you enjoyed this tale then you might like to check out The Arrangement, a tale of horror, winter and undying desire, soon available in Dark Voices from Lycan Valley Press. And if you're inspired to make jam click the link for the damson jam recipe I adapted and read about ways of testing jam. Ways of testing if jam is set. When I sat down to write Monster Huntress, I didn’t know much about the world in which it was taking place. I knew the type of world I wanted, but it transformed and evolved over the course of revisions, always growing either in size or in the details. While the story of Monster Huntress visits only a small portion of the world I’ve created, there are some lessons I’ve learned from J.R.R. Tolkien that have had a ripple effect toward my approach to worldbuilding. The biggest of those lessons was to provide the promise of something greater. What I mean by that is there is something more out there beyond what the reader is experiencing. There is a larger world, other events going on. There is a rich history, filled with named heroes and battles and events that can be referred to over the course of the book. The reader doesn’t need to know what the Wizard Wars were, for instance, but knowing that there was some massive war hundreds of years ago is important to provide the experience of an aged world. After all, we still refer back to events and wars that waged hundreds, and thousands, of years ago. The same will hold true in a fantasy book, unless it is a newly-formed world. Even new civilizations likely stemmed from somewhere with a history on that world. Some writers might take the “cut it” approach to those things, and my own editor prodded at some of those. I took a few out but kept others, because I wanted to provide depth to the world - it has a history, after all, even if I haven’t written it yet. It opens the door for significant events to be explored later in shorter forms of fiction, or even a spin-off book that covers some of those things. The landmark of her journey, a tall statue made from an aquamarine granite, loomed just ahead. Its features were smooth and worn from the weather, their individual faces indistinguishable, but she could still make out the original image carved by the sculptor. It was depicting a trio of men and one woman, a party of unnamed individuals that performed heroic deeds long ago during the Wizard Wars. When Ava was close enough she could read the short inscription at the base of the statue which read: "These four warriors fought to maintain the balance in the world. They fought bravely and their sacrifice for the side of the Light will forever be remembered." The rest of the words had been worn down to the point where they were no longer legible. Ava sat in her saddle and contemplated the deeds of these bold warriors from the past. Had they not acted perhaps the world would be radically different than the world she was living in now. It was clear, from the inscription that remained, that these four were important in shaping history. This scene was much longer, originally, giving some physical descriptions and some speculations on their individual roles. Yet I like the concise nature here. It gives you enough to emphasize their importance in making the world like it is, yet doesn’t steal the scene away from the main character. Look for more worldbuilding scenes like this to appear as the world I’ve built continues to grow. After all, Monster Huntress is set in a world with 13 kingdoms. By the end of book one, she’s only set foot into two of them, so the possibility for growth is quite large as she goes on more adventures in the Young Huntress Series. Want to get started on Monster Huntress? Grab a copy today! Want to learn more about the world I’ve built? Check out the earlier stops on the tour and meet some of the characters! The saying goes All good things come come to those who wait, and so here it is. 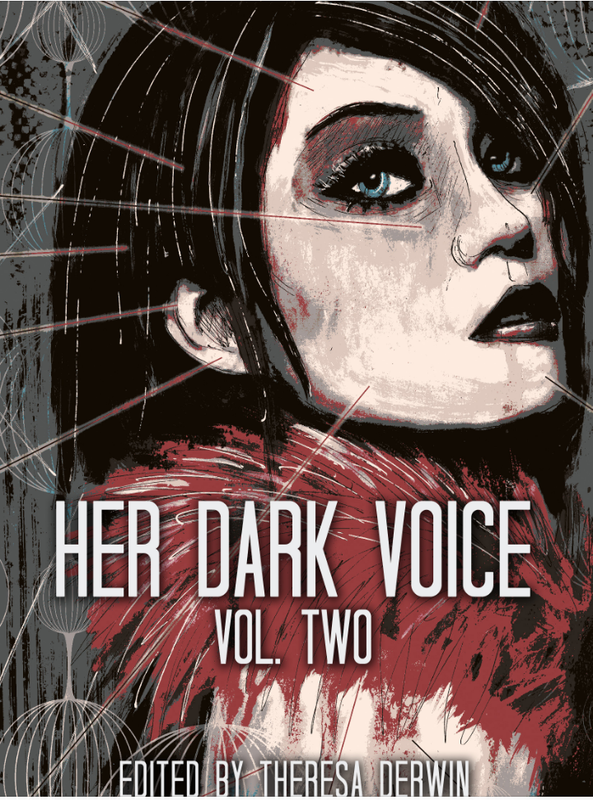 Her Dark Voice Volume Two, edited by Theresa Derwin and published by Quantum Corsets. I'm really looking forward to this anthology for many reasons. It is the second time that I have worked with Theresa Derwin - the last time being the Once Bitten anthology (currently free on Amazon Unlimited for kindle edition) from Knightwatch Press. Theresa is a super editor and staunch supporter of Women in Horror. Then there's the fact that this anthology will raise money for the charity Breast Cancer Now. I have pledged all my royalties to the charity. The launch is planned to coincide with Edge Lit 2018, where there will be author readings and so much more. My story will be nestled with a whole bunch of great reads from some superior authors. More on that later. Until then, feast your eyes on the cover! 2018 looms and I'm still wallowing in a dirge of expiring tech and a deluge of work-that-isn't-writing. (Stevie Smith's Not Waving not Drowning springs to mind.) Yet I am sure all is not lost! So here's the run down of 2017 - not an inspiring picture as you can see. There is a sliver of molten gold peeling across the horizon of 2018, however. Let's hope I can turn it into a wedge or even an ingot! On the reading front, my Goodreads Book Challenge target has been reached. Click the link to see. I have work, my family are well & happy and my bills are paid, so life has been a success for another year. Let's hope that 2018 offers you those luxuries (because the basics are becoming luxuries these days) and if you are supremely lucky, even more than that! Visit Naomi's profile on Pinterest.